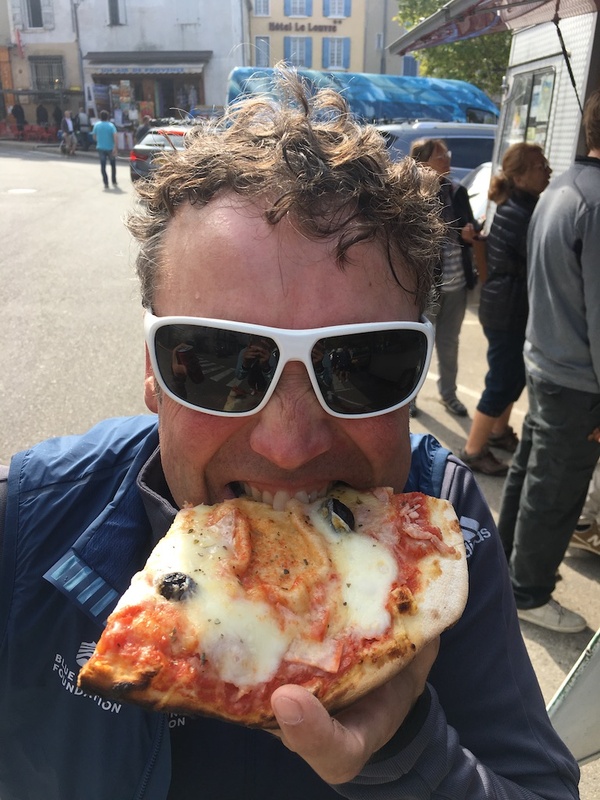 I know I should write about this amazing London to Monaco charity ride, and climbing Mont Ventoux, and how much money Blue Marine is raising for ocean conservation, but honestly, I’d like to write a more personal post that’s even more personal than the usual. And that’s simply because I got pretty choked up today. It started at about 18 kilometers to go to climb the iconic Giant of Provence when all of a sudden I felt like crying for joy and gratitude. In fact, I may as well be honest and just admit to it. I started crying behind my uber-Swizzle-esqe white sunglasses. You know the weird welling up that comes from somewhere deep inside that feels strange and welcome and actually kinda good when something just hits the emotional bulls-eye? Maybe it’s happens at a movie. Or at a funeral. Or when you get good news that you’re just not equipped to take in completely. Or bone-crushingly bad news. Or in my case, when you happen to be on pretty good form, and rocking extremely awesome socks, and ticking over a 25 tooth cassette on the opening 6% ramps at the base of a mountain in Provence that’s featured in Le Tour de France 15 times. Well, that’s what happened. I was overcome with a sence of gratitude that goes way deeper than garden-variety gratitude…a real, deep down, wonder-of-life gratitude that comes from realizing that in spite of some extremely rocky early years, I’ve got a life that’s filled with love and fun and goofyness and success and failure and most importantly, people who mean more to me than my silly little vanities and what can be at times, terrorizing fears and selfishness that come from silly little vanities and terrorizing fears. I love my family very, very much. And then Becks rocked up to me as I was weaving like a paperboy all over the road in an effort to get through the steepest sections of the climb at about 10 kilometers to go. My buddy Becks that I met on last years London to Monaco ride. My buddy Becks who is real and awesome and smart and a badass cyclist with a heart of gold. 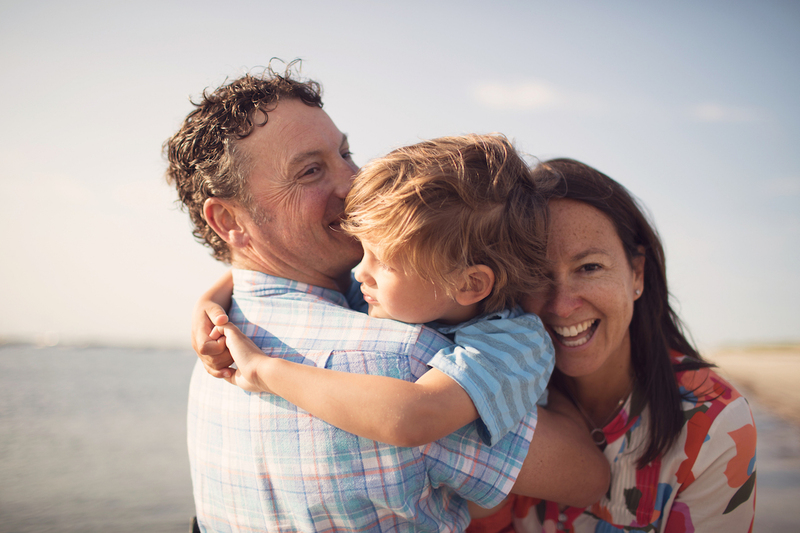 And we had one of those talks that people who share a common hardship/adventure have that is stripped of all vanities and fears and allows for what all of us crazy humans crave…connection. I told her about how much I love my family and how great it is to have a 5-year old boy. And I found out about what’s been going on in her life since we were last rocking the 1,000 mile London to Monaco cycling jam together. And she helped me. She helped me get through the hardest part of the climb by distracting me from the pain in my legs and more importantly, allowed me (us) to share the awesomeness–the views, the smells, the sun, the accomplishment–of what we were doing…in the moment. 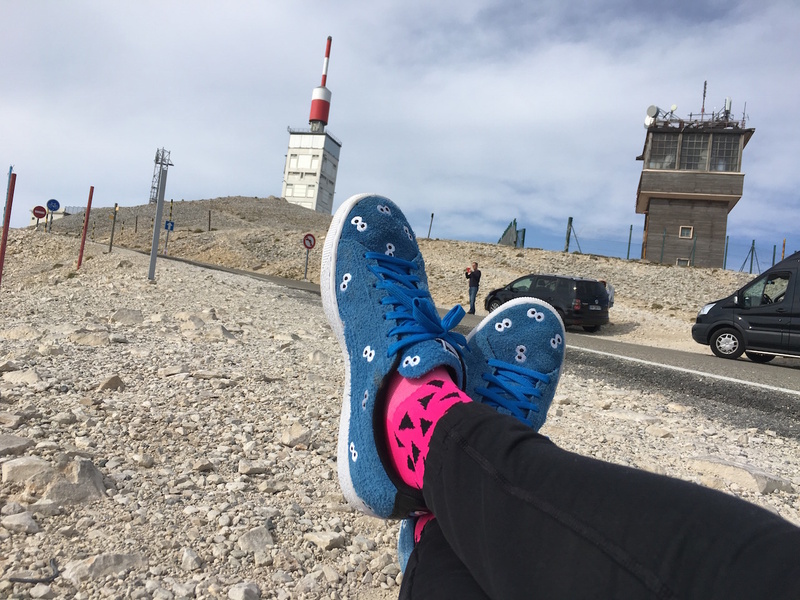 The rest–getting to the top, standing at the base of its red and white tower, the coffee, the high fives, the selfies and sock of the century photos–was just icing on the cake. Then we descended (for about 40 minutes!) 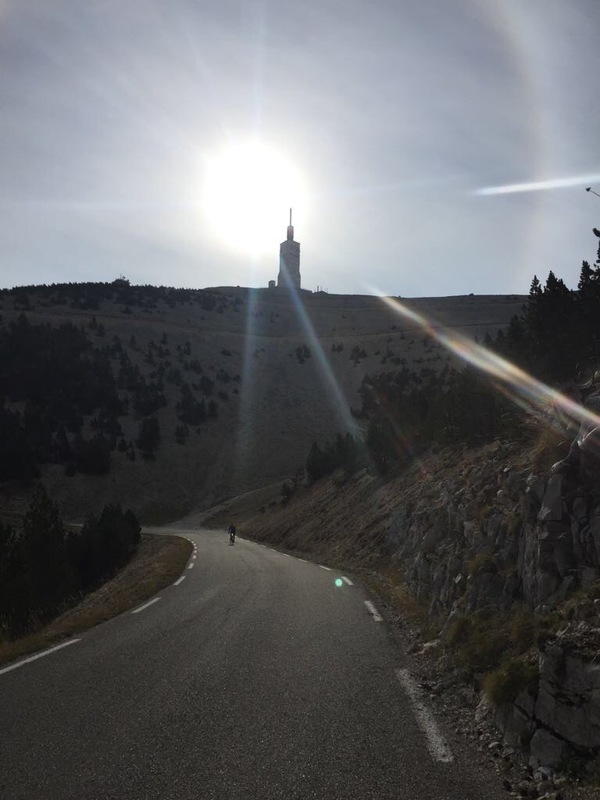 down Mont Ventoux. And smelled fields of lavender that this area of Provence is known for. And ate pizza in a little French village. And gelato. And then we stopped at the top of the last little climb of the day. And Becks gave me a few pieces of candy for a burst energy before pushing off on our last real decent of the day. Soon, we were going 35-40 miles-an-hour. Then I heard a sound from behind that no cyclist who’s going 35-40 MPH wants to hear–the sound a carbon fiber bike makes when it smashes to pieces on the road. It’s the disturbingly mechanical sound of fractures and breaking and pain. And then Jimmy was speeding down and screaming for the others to stop. But I was the only one who was close enough to hear. I don’t really know what else to say, except for this second-hand report…her little body skidded and rolled across the tarmac for a very long time. Her helmet exploded. Her bike exploded. Her body laid limp where it finally came to rest. And then she pushed herself up with the palms of her ripped-up hands. And the pros took care her like the pros they are. 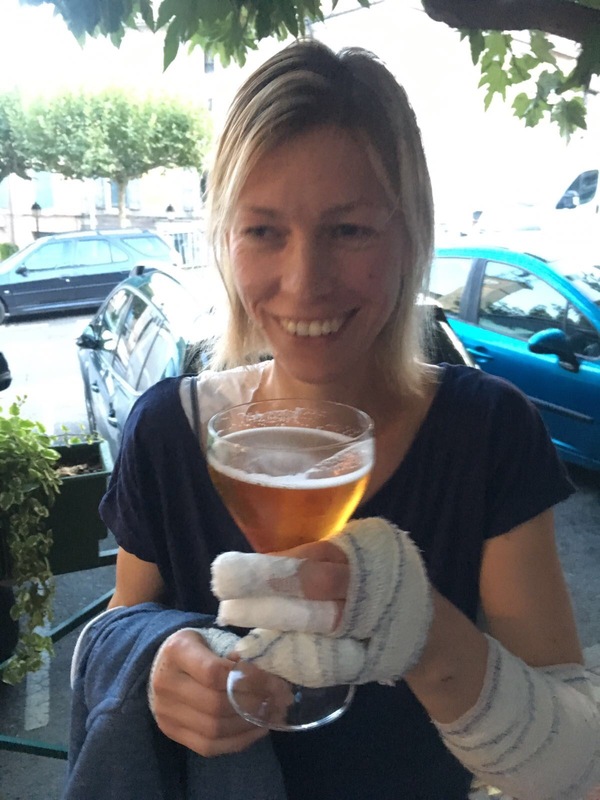 And she eventually sat up, and then got in the back of the car, and went to the local hospital where they confirmed that no bones were broken, and the deep road rash on her hands and knees and shoulders and back got treated as best as it can be. Becks is tough and amezeballs. And then, as I was siting face-down on the massage table in the narrow hallway of our charming little hotel in Sestrion getting what I’ve come to term as a “Swizzle Flush” (i.e. a medium to hard pressure massage that’s best at flushing the day’s lactic acid out of my 49.25 year-old body) when I heard her voice. And it sounds like she want’s to ride tomorrow. And yes, the London to Monaco ride rides on. In fact, tomorrow is billed as the hardest day yet. Cycling From London to the Sea (and for the Sea)! Previous articleWho wants to come on the Ultimate Luxury Trip with me?